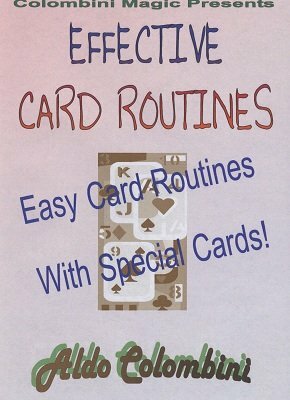 Here you have ten strong routines by Aldo Colombini using special cards (easily found). ADD-ACADABRA: Two predictions. After a couple of gags, the predictions are shown correct. TURNING POINT: A card is reversed in the deck. Four double-blank cards are shown and one is selected. This card now bears the image of the chosen card which is now blank. CHIP-CHIP HURRAY: You show seven cards and two poker chips. One card is selected and the same image appears on one of the chips. The other cards are all blank. MICKEY FINN: One card is selected among six. This card has a poison sign on it and the other cards are just glasses. Can be done the opposite way. NOSE OUT: Several cards with clowns with different colored noses are shown. One is selected and the same colored nose appears on your nose. TWICE BLANK: You print two selected cards using double-blank cards, one after the other. At the end, these two cards blend into one. IN BETWEEN: A card disappears completely from the deck and reappears between two jokers with a big surprise. BLOWN AWAY: A freely selected card matches three other cards, making a four-of-a-kind. When the spectators think that all the cards are the same, they are, but completely different from the selection. MIXED RELATIONS: A card is selected (say the 4H). You show four blank-faced cards. All the cards turned to be duplicates of the selection. LEFT BEHIND: Six cards from Ace to Six. A spectator selects a card. You show that you have predicted the selection.